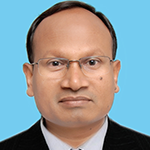 Dr G R Sinha is working as Adjunct Professor at International Institute of Information Technology (IIIT) Bangalore, and presently deputed to Myanmar Institute of Information Technology (MIIT) Mandalay. He obtained his B.E. (Electronics Engineering) and M.Tech. (Computer Technology) from National Institute of Technology, Raipur. He received Gold Medal for obtaining first position in the University. He received his Ph.D. in Electronics & Telecommunication Engineering from Chhattisgarh Swami Vivekanand Technical University, Bhilai. He has published 219 research papers in various international and national journals and conferences. He is active reviewer and editorial member of more than 12 Reputed International Journals such IEEE Transactions on Image Processing, Elsevier Computer Methods and Programs in Biomedicine, Springer Journal of Neural Computing and Applications etc. He has reviewed research papers of many International Conferences including IEEE conferences. He has teaching and research experience of 20 years. He has been Dean of Faculty and Executive Council Member of Chhattisgarh Swami Vivekanand Technical University, Bhilai. He is currently a member of Senate of Myanmar Institute of Information Technology (MIIT), Mandalay. He has filed a Patent on Computer Vision and its Application in Assessment of Cognitive Ability of Human Brain. Dr Sinha has been appointed as Distinguished Speaker in the field of Digital Signal Processing by ACM for next three years (2017-2020). He has been appointed as Expert Member for Vocational Training Programme by Tata Institute of Social Sciences (TISS) for Two Years (2017-2019). He has been Re-elected as Chhattisgarh Representative of IEEE MP Sub-section Executive Council 2017. He was elected as Chhattisgarh Representative of IEEE MP Sub-section Executive Council 2016. He has been selected as Distinguished Speaker in the field of Digital Image Processing by Computer Society of India (2015). He is recipient of many awards like TCS Award 2014 for Outstanding contributions in Campus Commune of TCS, Rajaram Bapu Patil ISTE National Award 2013 for Promising Teacher for Creative work done in Technical Education by ISTE New Delhi, Emerging Chhattisgarh Award 2013: Best Academician, Engineer of the Year Award 2011, Young Engineer Award 2008, Young Scientist Award 2005, IEI Expert Engineer Award 2007, nominated for ISCA Young Scientist Award 2006 and awarded Deshbandhu Merit Scholarship for 05 years. He has been selected as Distinguished IEEE Lecturer in IEEE India council for Bombay section. He has been elevated to Senior Member of IEEE. He has authored Six Books including Biometrics: Concepts and Applications published by Wiley India, a subsidiary of John Wiley and Medical Image Processing: Concepts and Applications published by Prentice Hall of India. He is Consultants of various Skill Development initiatives of NSDC, Govt. of India. He is regular Referee of Project Grants under DST-EMR scheme and several other schemes of Govt. of India. He received few important consultancy supports as grants and travel support. He has delivered many Keynote/Invited Talks and Chaired many Technical Sessions in International Conferences in Singapore, Myanmar, Mumbai, Trivandrum, Hyderabad, Mysore, Nagercoil, Nagpur, Kolaghat & across the country. His Special Session on “Deep Learning in Biometrics” was included in IEEE International Conference on Image Processing 2017. He is Fellow of IETE New Delhi and member of International Professional Societies such as IEEE, IACSIT & SIE Singapore and also of many National Professional bodies like ISTE, CSI, ISCA, and IEI. He is member of various committees of the University and has been Vice President of Computer Society of India for Bhilai Chapter for two consecutive years. He has Guided Four PhD Scholars, 15 M. Tech. Scholars and has been Supervising 05 more PhD Scholars. His research interest includes Biometrics, Deep Learning, CAD & Medical Image Processing, Computer Vision, Employability Skills; Outcome based Education (OBE) etc.